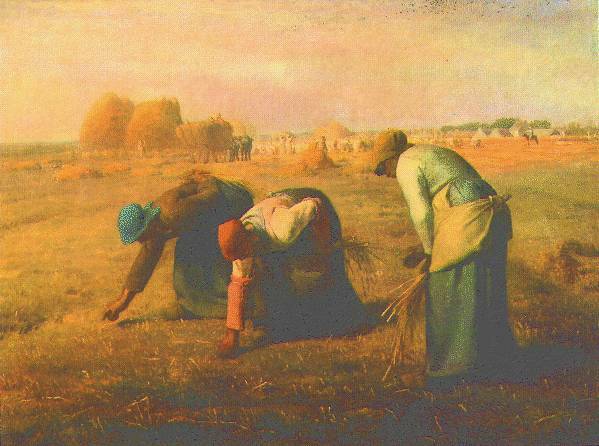 (1814-75) The son of a small peasant farmer of Gréville in Normandy, Millet showed a precocious interest in drawing, and arrived in Paris in 1838 to become a pupil of Paul Delaroche. He had to fight against great odds, living for long a life of extreme penury. He exhibited at the Salon for the first time in 1840, and married two years later. At this time, the main influences on him were Poussin and Eustache Le Sueur, and the type of work he produced consisted predominantly of mythological subjects or portraiture, at which he was especially adept ( Portrait of a Naval Officer , 1845; Musée des Beaux-Arts, Rouen). His memories of rural life, and his intermittent contacts with Normandy, however, impelled him to that concern with peasant life that was to be characteristic of the rest of his artistic career. In 1848 he exhibited The Winnower (now lost) at the Salon, and this was praised by Théophile Gautier and bought by Alexandre Ledru-Rollin, the Minister of the Interior. In 1849, when a cholera epidemic broke out in Paris, Millet moved to Barbizon on the advice of the engraver Charles-Emile Jacque (1813-94) and took a house near that of Théodore Rousseau. Devoted to this area as a subject for his work, he was one of those who most clearly helped to create the Barbizon School. His paintings on rural themes attracted growing acclaim and between 1858 and 1859 he painted the famous Angélus (Musée d'Orsay), which 40 years later was to be sold for the sensational price of 553,000 francs. Although he was officially distrusted because of his real or imaginary Socialist leanings, his own attitude towards his chosen theme of peasant life was curiously ambivalent. 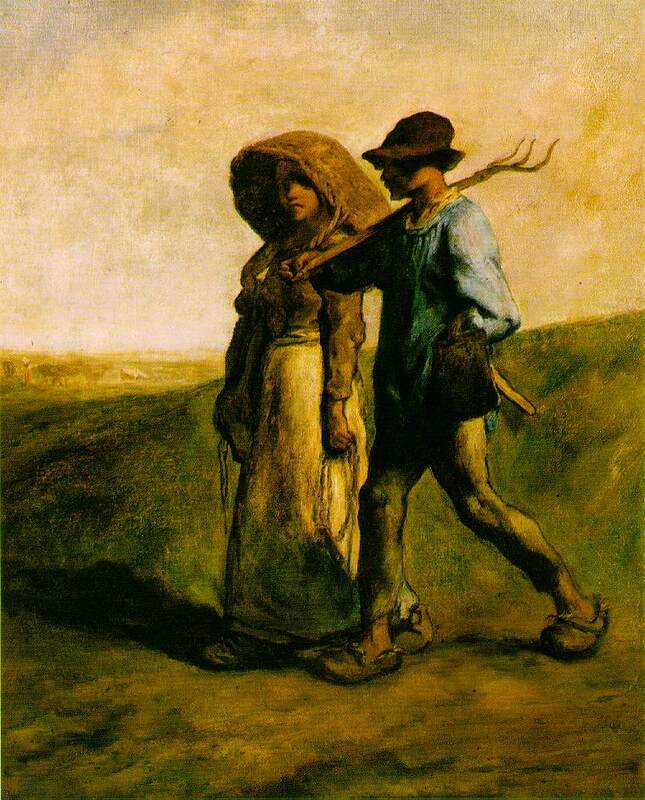 Being of peasant stock, he tended to look upon farmworkers as narrow-minded and oblivious of beauty, and did not accept the notion that `honest toil' was the secret of happiness. In fact, his success partly stemmed from the fact that, though compared with most of his predecessors and, indeed, his contemporaries, he was a `Realist', he presented this reality in an acceptable form, with a religious or idyllic gloss. Nevertheless, he became a symbol to younger artists, to whom he gave help and encouragement. It was he who, on a visit to Le Havre to paint portraits, encouraged Boudin to become an artist, and his work certainly influenced the young Monet, and even more decidedly so Pissarro, who shared similar political inclinations. Although towards the end of his life, when he started using a lighter palette and freer brushstrokes, his work showed some affinities with Impressionism, his technique was never really close to theirs. He never painted out-of-doors, and he had only a limited awareness of tonal values, but his draughtsmanship had a monumentality that appealed to artists such as Seurat and van Gogh, who was also enthralled by his subject-matter, with its social implications. Millet's career was greatly helped by Durand-Ruel.